I always loved animals and so want to do my best for my, customers, the pets and humans. 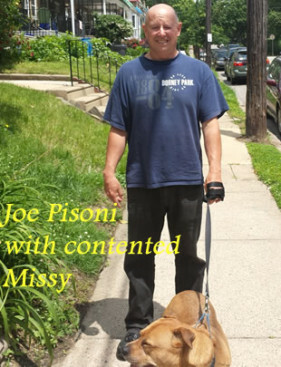 Joe Pisoni grew up in the Olney section of Philadelphia, graduating from Olney High School and Community College of Philadelphia. He always liked animals and decided to make pet sitting a profession when his family lived in Barnegat, NJ. He is an accredited professional pet sitter by Pet Sitters International. After moving back to Philadelphia in 2006, he continued the business. He primarily covers the Mt. Airy, Germantown and Chestnut Hill sections of Philadelphia and suburban Wyndmoor. He lives in Mt. Airy with his wife, Clare, daughter, Mary, son, Sam, dog, Carter, kitten, Annabell, and a guinea pig, Cole. Somebody has to take care of the Pisoni pets, too. Sometimes, his children literally help him with the business, hence (M)ary, (J)oe and (S)am Pet Sitting.